The Mandrake is a luxurious boutique hotel in Fitzrovia in the heart of London’s West End. Inspired by the medicinal properties of the plant after which it is named, the interior is eclectic and vibrant and features carefully curated artwork and intriguing soundscapes. 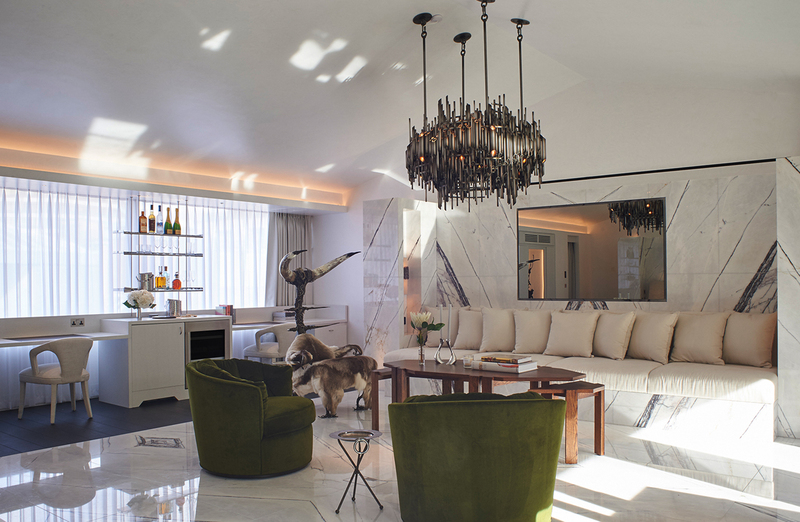 When it came to lighting for The Mandrake’s Penthouse Suite, designer Lara Bohinc chose Dernier & Hamlyn for the room’s very distinctive chandelier because she had been told we were probably the only company in the UK who could respond to her demanding commission. The resulting chandelier comprises hundreds of metal tubes hand formed in brass. Each tube was hand finished in antique nickel and mechanically fixed to the fitting’s aluminium frame. This ensured that the metal finish was of the very highest quality and consistency while the frame was as light as possible to aid installation. This beautiful chandelier is fitted with more than 30 LED G9 lamps that give the perfect level of illumination for this very special room.